I need help! Logan is crate trained and learned to use the doggy door when he has to do #2. My problem is peeing. It's only about once a day he will do a quick urinate on the carpet. I must be doing something wrong. When will he get that he must go outside each time? Do I need to keep up the crate training longer? It's already been about 2 months. My husband feels so bad for him. Logan loves his crate but I feel I need to do something else. Any suggestions are greatly appreciated! Oh I forgot, he's about 7 mos old. He's been with me since July. Thanks for all the suggestions! I have the Oxy carpet cleaner. I do praise him when he does go outside. 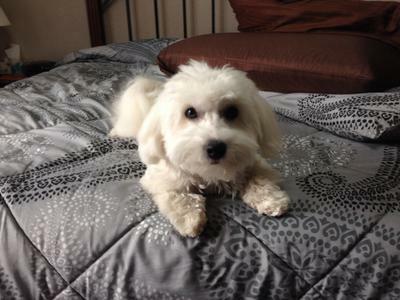 I also have a Havanese which has caught on but I guess Logan still needs some time. Thanks again. Looks like all good advice here, patience and the right cleaners. I had to un= train my dog from going outside all the time, to using the pee pad inside by the door to the outside in emergencies, because I have been bedridden a long time and not always able to get him outdoors when he needs to go. He's real good about holding the poop in, but if he needs to go pee, he holds it as long as possible, and does need to use the pee pad about once or twice a week. When we go out, he knows that's the right place to go, no problem. I guess you'd call Tuffy a multi-tasker! I would just emphasize when your dog is making outside say "pee poop! !Good boy/or girl,or dog, use a happy high pitched excited voice every time. I take my dog out at least five times a day, but I do not go out very lat at night, so that's when the pee pad comes in handy for Tuffy.I also use Woolite Oxy cleaner it sprays foam and really gets doggies stains and odors out. Their is a very good newsletter on this website all about house training. When u go to clean ur carpet again put some oxy clean in with ur steamer or rug scrubber that will get the smell out. If in a steamer use it in the rinse section. Try to stay away from vinegar since it has a tendency to attract the dog to still pee in same area. Louie is 4 years old and finally house trained. I didn't think it would ever happen. I had to replace carpet. Just be patient and take your Coton out as often as you can. You may need to clean the carpet with pet neutralizer so there is no smell so he doesn't have the desire to go. This could be the reason he keeps peeing on the carpet. Although our dogs (Coton and Havanese) are housebroken with no accidents, we do take them out as frequently as we can.